If you are those who look for a budget phone which features with touchscreen display, then here may be another option for you. T-Mobile has announced the availability of LG Sentio at its retail stores. 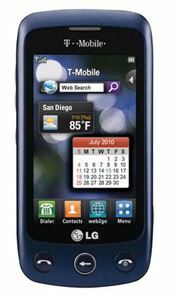 The LG Sentio is a slim and stylish phone with a 3-inch touchscreen display and on-screen QWERTY keyboard. It is also equipped with 3-megapixel camera for capture still images and video. Furthermore, the phone has been enhanced with a built-in media player for users to enjoy their favorite songs and videos. Display – A 3-inch touchscreen display with auto rotating features. Communication – Supports 3G connectivity and Bluetooth enabled. Camera – A 3-megapixel camera. Multimedia – Supports music player and video playback. Messaging – Supports text, picture, social networking and email. Memory slot – Supports memory card slot (microSD). Battery – Comes with a 900mA battery that provides up to 6 hours of talk time and up to 16 days of standby time. The LG Sentio with dimensions of 4.2 x 2.1 x 0.5-inch and weighs 3.3 ounces is available at T-Mobile for the price of $70 with two-year service contract after $50 mail-in-rebate.